Learn how to beat the Guardian Ape, one of the toughest boss fights in Sekiro: Shadows Die Twice. Having taken down Genichiro Ashina and Lady Butterfly, Sekiro: Shadows Die Twice’s minibosses may feel fairly tame by comparison. Snake Eyes Shirafuji? Shot down comfortably. Armored Warrior? Left in a pile of rust. If you’ve been looking for your next challenge, then look no further than the Guardian Ape. This rampaging beast may be the toughest boss you’ll have faced up to this point and will test your patience like no other. If you’re struggling to overcome this pesky primate, fear not, in this guide we’ll teach you how to beat the Guardian Ape boss fight in Sekiro: Shadows Die Twice. The Guardian Ape is found directly after the Bodhisattva Valley Sculptor’s Idol in the Sunken Valley. He’ll be minding his own business in a pool of shallow water, but when approached, he’ll quickly turn aggressive. The Guardian Ape only has one deathblow marked above his vitality bar, but don’t let that fool you, this ape is not messing around. Because of his enormous posture bar and relatively fast reset speed, this battle is all about chipping away at his vitality. It’s very likely you won’t break his posture until you drop him to zero vitality. The Guardian Ape is a two-stage boss fight, so we’ve split our guide into two distinct parts below, with tips on how to succeed in both. The key to overcoming this fight is in knowing that the Guardian Ape offers up very few opportunities to strike back at him safely. Try to be aggressive and he’ll overpower you in no time, but play very patient and only attack when certain you can land a blow, and you’ll eventually take him down. Let’s get started by looking at the moves you need to recognize and the strategies required. The Guardian Ape is a ferocious, high damage enemy who moves quickly around the arena. Your goal during this fight is to be moving at all times, attempting to hold the centre stage in the arena, but keep a middle distance from the Ape. You are trying to bait out specific moves from him that will let you attack back, and should only go in for a hit when they come out. This means sprinting out of range from most of his attacks, so you need to be sure you have the room behind you to do so. While you can use the trees in the water to zip around, they’re not all that useful and will often serve to get in your way more than help. The Guardian Ape will also break any he touches over the course of the fight. You can also tether to the sword lodged in his shoulder when he roars, but it’s rare this allows for much damage, and he’ll typically strike soon after, so be careful. Regarding prosthetic tools, the Shinobi Firecracker will stagger the Guardian Ape, freeing him up for an attack. Be careful though. around halfway through the first stage he will begin to do a body slam when exposed to firecrackers. You’ll still have time to slash him after, but will need to dodge this first. If the ape is on almost no health, Spinning Shurikens can deal slight damage to him. Along with some general arm swings and a lot of running around and making noise here are the moves you should watch for, and which you can use to strike back. We’ve marked the moves to wait for with an asterisk so you know which allow you to attack back. Attack-Sit-Attack: Guardian Ape swings twice with his right arm before sitting down with his back to you. This move looks open to attack, but roughly 50% of the time after sitting he will then bounce out into an extra series of attacks. Our advice is to stay back unless you’re feeling particularly confident. If you stay close to his rear after the sit, the Guardian Ape will often follow the move with a poisonous fart. You’ll need to run out of range of the gas, but try to stay close to the ape, as the fart is always followed by a Poop Throw. *Poop Throw: Guardian Ape hops forward, pulls dung from his rear, leaps into the air and throws it at you. This move deals shockingly high damage and will also fill your poison status by nearly half. It’s also one of the best moves to counterattack. While sprinting, try to stay only a medium distance from the Ape. As soon as you see him sit down and reach for his rear, run directly towards him. He’ll leap over your head, missing with the poop and landing behind you. Follow and deliver a charged thrust. If you’ve stuck close, you’ll have time for two charged attacks. Remember that if he does a fart attack, he will always follow it up with a Poop Throw. *5-Hit Combo: Guardian Ape roars, swinging through five attacks as he rolls forwards. The final attack is a jumping slam. Sprint backwards and charge a sword hit as he lands on the final slam. He recovers quickly from this move, so only go for one attack or a fast followup slash if you timed it well. Run away after as he’ll often follow this with a Sweep Grab. Sweep Grab: Guardian Ape hops slightly once, then sweeps his right arm through the water. Red warning kanji will flash up before the grab, so run away as fast as you can. Avoid this move at all costs as it deals enormous damage. *Uppercut to Back Roll: Guardian Ape sweeps upward from the floor with his left arm, then falls onto his back. He then flails left and right four times. Your goal is to sprint around to his head as he falls and charge an attack. Time your attack right as his last flail lands and you’ll have time for a second charged strike before you back off. Stick to one attack if you’re not comfortable with the timing. This is one of the safest moves to attack if you follow these steps. *Leaping Grab: Once his vitality is reduced to half, the Guardian Ape will begin throwing in a Leaping Grab attack. He will stand upright as he walks towards you, then jump through the air with arms outstretched. Sprint backwards and jump to avoid this, then charge an attack as he lands in a roll in front of you. It’s easy to see coming, and you should have time for two strikes after he lands. *Stagger: Occasionally during the fight, you’ll also stagger the Guardian Ape with your attacks, causing him to fall forward with his head lowered to the floor. Follow this up with two more strikes for extra damage and he’ll then roll backwards and run away briefly. Eventually you’ll whittle down his vitality enough to land a death blow, at which point you’ll cleave off his head and be rewarded with the Shinobi Execution message. Phew, job done, right? WRONG. 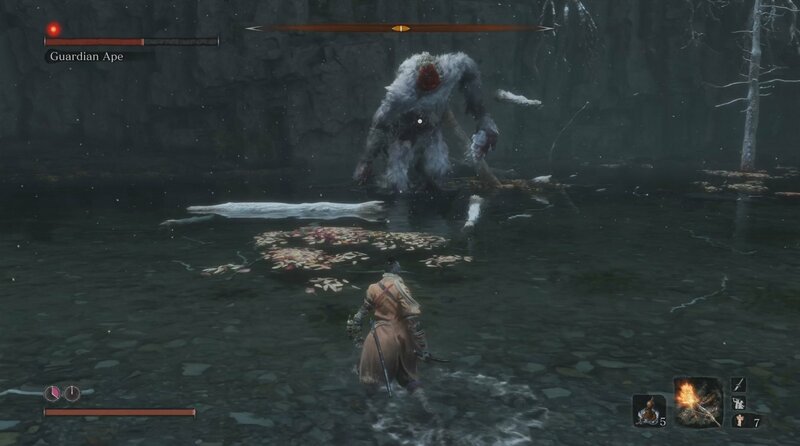 The Infested Guardian Ape will soon stand back up, picking up its severed head and the sword you used to cut it off. Ooh err. The bad news is, to nail this half of the fight, you’re going to need to land your deflections. The good news is, if you can land those parries, this half of the fight should be notably faster than the first. The headless ape’s movements are incredibly unnerving, but his range of moves is significantly reduced. His deadly grab is gone, but you’ll now need to watch out for two unblockable sweep attacks and a Terror Scream instead. You can’t get away with simply dodging the Guardian Ape’s attacks any longer. In Stage 2 you’re going to need to deflect his attacks in order to gain an opening. His sword swings are relatively slow, but deal immense damage if you mess up the timing. After a few deflections, he’ll eventually follow up with a massive, overhead swing. Deflecting this will make a distinct clanging sound and stun him, letting you get in three or so charged sword strikes or, preferably, a spring-loaded Flame Vent shot. Terror Scream: By far the most dangerous new attack, the Guardian Ape wiggles its body left and right and places its head over its neck, sucking in gas. A red kanji warning will flash up before the Ape screams, causing Terror build up and damage in a sphere around it. If your Terror gauge reaches maximum you will die instantly, so as soon as you see this motion and kanji, sprint away. Pacifying Agent can be used to lower you Terror, but it’s best to learn the move and stay out of range every time it’s used. *Leaping Sweep: The Guardian Ape jumps high in the air, diving down into a sliding sweep attack with red warning kanji. Jump over and towards this as the ape lands to avoid it. You can do a kick counter, but you’re not here for posture damage, so slash at his vitality instead. Fast Sweep: The Guardian Ape Sweeps his sword round in a low, unblockable hit. Red warning kanji will flash up, so either jump towards or back away from the Ape when you see it. Sometimes he will interrupt his other sword combos with this attack, so keep your finger close to the jump button. *Multiple Pokes: The Guardian Ape pokes his sword forward left and right several times. Deflect any of these and he’ll wiggle upright into a large overhead swing. Hit R1 right as his arm begins to lower to deflect this and stun him briefly. Attack with sword or prosthetics for high damage. *Sword Slams: The Guardian Ape slashes his weapon from right to left once, then follows up with five more hits from above. The sixth, delayed hit must be deflected to stun him and follow up with an attack. Diving Lunge: The Guardian Ape dives forward, sweeping his sword round. You can jump towards and past this attack to land a couple of sword hits, but be sure to block while in the air in case your timing is off. Otherwise, jump backwards and away from the strike. Backwards Slash: Sometimes the Guardian Ape will mix up its sword combos by throwing in a backwards slash. He’ll turn his back on you, slicing upwards as he retreats. Don’t be lured in, as he’ll usually follow up by spinning around with a lengthy slash or two. Parry this and you may be rewarded with an overhead strike to stun him. The Guardian Ape boss fight is extremely challenging, but persevere and you’ll eventually be rewarded with an incredibly satisfying execution animation. And yes, he really is dead this time. Winning will grant you a memory that can be used at an idol to permanently boost your attack power, and the Slender Finger which can be used to create a new Shinobi Prosthetic Tool. If you’ve managed it, congratulations on learning how to beat the Guardian Ape boss fight in Sekiro: Shadows Die Twice! If you’re heading to Senpou Temple next, take a look at our guides for the Armored Warrior and Long-arm Centipede Sen’un.